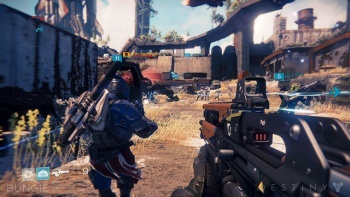 Activision CEO Bobby Kotick has revealed that the publisher intends to spend $500 million in developing and promoting Bungie's sci-fi shooter Destiny, with analysts proclaiming that this would be the highest sum spent on a single game. Just how big of a business are games these days? It seems the market is big enough that spending half a billion dollars for a single game is now feasible. During the Milken conference in Los Angeles last week, Activision CEO Bobby Kotick has revealed that the publisher intends to spend $500 million in developing and marketing Bungie's upcoming game, Destiny. This budget which is even bigger than some of Hollywood's, will include "marketing, packaging, infrastructure support, royalties and other costs," an Activision spokesperson said. In the conference, Kotick mentions, "If you're making a $500 million bet you can't take that chance with someone else's IP...The stakes for us are getting bigger." In case you didn't know, Kotick is referring to the deal Activision has signed with developer Bungie back in 2010 that gives the publisher exclusive distribution rights and significant control over the franchise. According to an Activision spokesperson, "Bungie's very ambitious plan is designed to unfold over a 10-year period...The depth of creative content, scope and scale is unprecedented and is required to bring Bungie's vision to life." However, don't expect the same budget for Destiny's sequels, with the spokesperson adding that the investment in the shooter's next-gen engine and a "robust backend infrastructure are upfront expenditures that should reduce future product development costs." The spokesperson finishes by saying Activision thinks that "Over the long term, we expect the ultimate product costs to be roughly in line with other Triple-A titles." Analysts are saying that the $500 million budget would likely be a record spent on a single game, especially one that's a brand new IP. Based on the budget, it's estimated that Activision has to sell about 15-16 million units just to break even (at $60 per game), which is no small feat even for an established franchise. Sterne Agee analyst Arvind Bhatia muses, "It's a head scratcher...For brand new IP, it's tough but it could post a big surprise." Bhatia estimates Destiny will sell eight million units, which is a figure I assume Activision won't be content with. Do you think Destiny will be worth the half billion budget Activsiion is allocating for it? And for Activision's sake, will it be the franchise to takeover Call of Duty and its year-by-year lagging sales? Destiny will be out this September 9 for the PS3, Xbox 360, PS4 and Xbox One. In the meantime, go check out the shooter's latest gameplay trailer entitled "The Devil's Liar."